An analysis of 3000 tweets sent by the Clinton and Trump campaigns between March and early September this year (2016) reveals stark differences in both content and social media exposure. Up to September 2016, Trump boasted a number of 11.6 million Twitter followers compared to 8.86 million for Clinton. The average number of retweet for Trumps’ Twitter posts (5493) is also roughly twice as high as that from Clinton’s (2556). Interestingly, as of July 2016, the number of daily tweets from Clinton’s account doubled to roughly 30 tweets daily while that same figure from Trump hovered around 12 tweets a day. These statistics suggest that Trump is gaining more engagement from Twitters’ users, even though Clinton is also fighting hard to gain presence in social media. Clearly, both candidates refer to each other consistently in their tweets. Clinton mentions Trump primarily in terms of his disrespect for generals, immigration policies, tax breaks for the wealthy and failure to release tax returns. Popular themes in Clinton’s tweets are “families”, “women” and “jobs”. She tends to use words that suggests the togetherness of the American community as well as a positive attitude towards good changes for America. Similarly, Trump made many references to Clinton through his posts, although he tended to use her first name, rather than her last. The word “Hillary” or the phrase “Crooked Hillary” was mentioned 547 times. 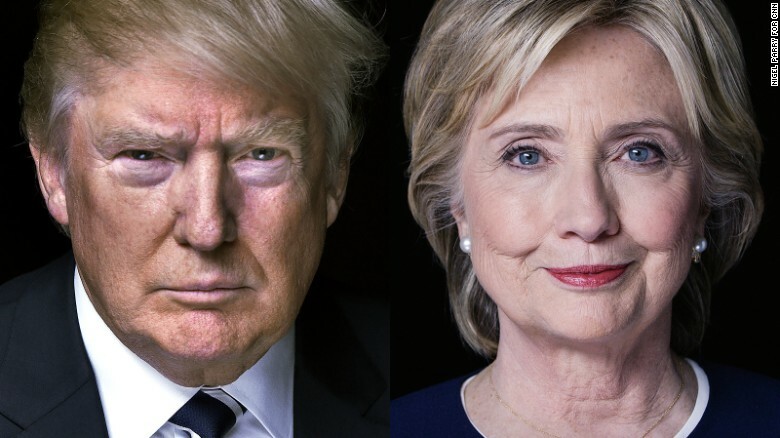 Common topics that Trump addresses include controversy around Clinton’s emails, media manipulation, and criticism towards Clinton’s policies on foreign affairs and immigration. Interestingly, Trump refers to Democrats, like Bernie Sanders and Barack Obama, as well as Republicans like his former opponents Ted Cruz and Marco Rubio. Unlike Clinton, Trump tends to make a greater use of words with negative tones, which sketch a pretty bleak portrait of the U.S. , perhaps to make the case for the need to, as his campaign slogan phrases it, “Make American great again”. 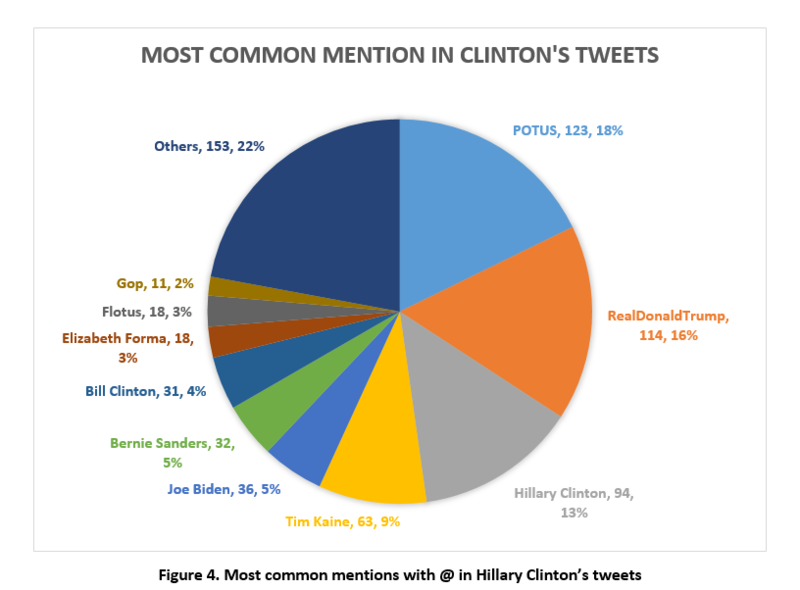 In her tweets, Clinton frequently mentions @realDonaldTrump, but Trump does not seem to tag Clinton or mention her Twitter handle even though his Tweets mention her name consistently. Clinton seems to employ the strategy of engaging with and directly mentioning her opponent’s Twitter account, whereas Trump chooses to simply ignore his rival. It remains to be seen which strategy is more effective in this presidential election. While Clinton tends to mention Twitter users who are figures of her political party – @BillClinton for example, Trump referred to various right-wing media shows and channels – such as @FoxNews and @MegynKelly. 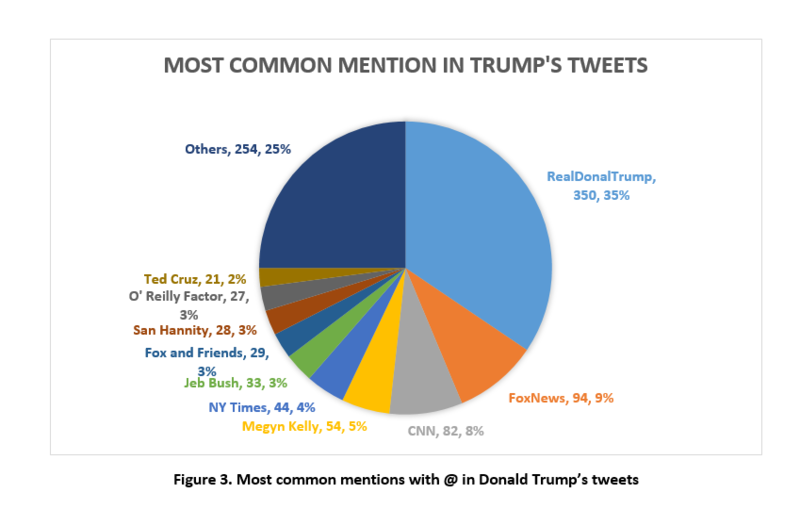 Interestingly, Trump’s posts with mentions have on average 4 times the number of retweets as those without mention. Clinton’s posts with mentions have a 3 times higher number of retweets. Thus, mentions appear to increase the likelihood of retweets. Given that the average number of retweets for Trump’s posts is greater than that of Clinton’s, it seems like Trump’s way of using mentions may help him gain more attention from Twitter’s user community, although there may be other explanations as well.